You normally heard about auditing in organisations, in different sectors to audit accounts which is crucial for industries. Actually auditing means inspection of company, books, accounts and documents etc. Now what is database auditing? Database auditing is nothing but monitoring and capturing database events and activities. Auditing keeps track of user activities at database level and instance level like login, logout, execute, insert, update, delete, create, drop, alter etc. 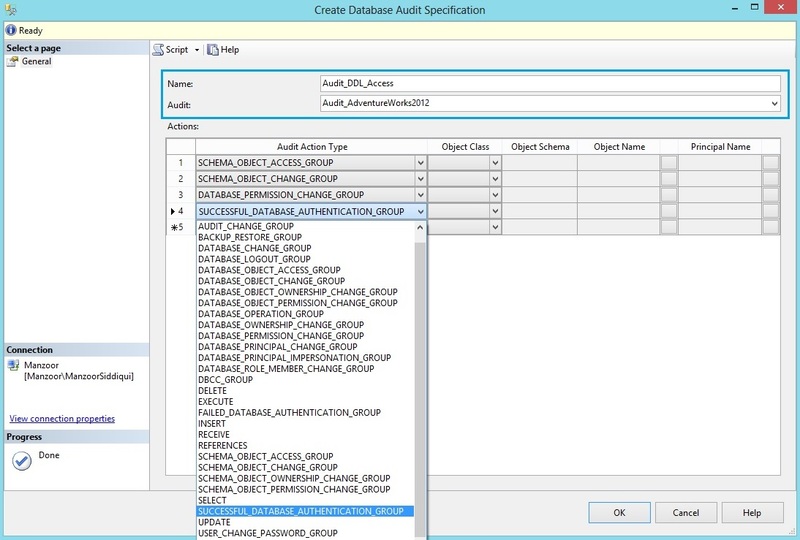 For every audit of SQL Server database you can create only one database audit specification and Database level auditing is not available with all editions of database, it is available only in Enterprise, Developer and Evaluation editions. You can audit at server level events and/or database level events as per your specification created. 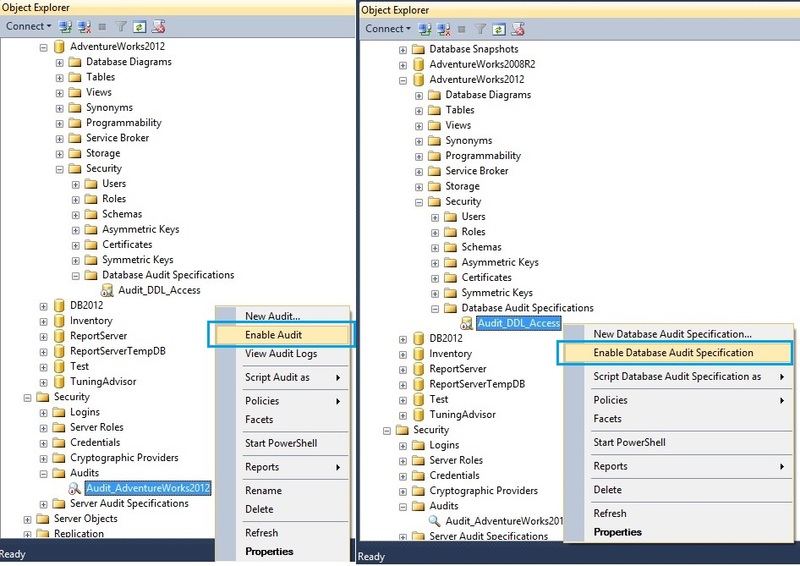 Here I am going to create step by step database level auditing with SQL Server Management Studio and T-SQL which is quite interesting and important for database professionals. Here we are creating audit on AdventureWorks2012 database. We have different options to create audit destination like on File or Security Log or Application Log. Here we will take File as our audit log destination so create one folder for audit file path (i.e. C:\AuditDemo). Now we will create New Audit. 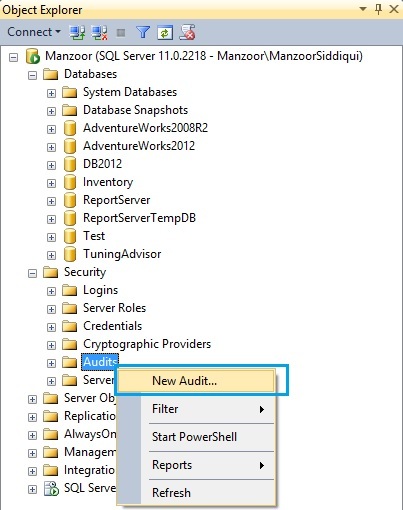 Connect to your database instance, go to Security, right click on Audit and select New Audit… as shown below in Figure-1. New Audit window will pop up where you have to write Audit name, select the state of database server On Audit Log Failure i.e. either to Continue or Shut down or Fail operation. 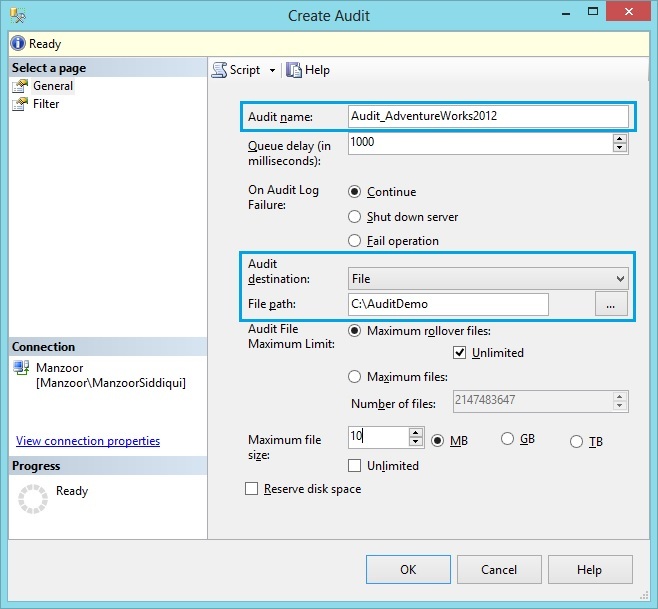 Audit destination I will select File to capture events but you can also choose for Security Log or Application Log if you are on network and bound to follow windows security policies and network policies etc. 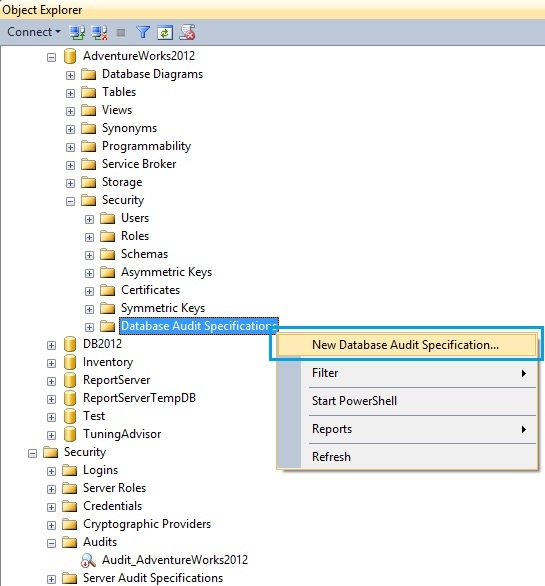 Select File path as C:\AuditDemo, and choose Maximum rollover files and file size as per your requirements and click OK.
Now create New Database Audit Specification. Now you have to specify Name and select Audit from drop down which we have created. Select your Audit Action Type from given drop down options as per your your requirements and click OK.
As we can see both audit and audit specifications are disabled by default so you need to Enable it as shown in Figure-5. Now, you can execute some sample queries and monitor the events in results panel where lots of interesting details are available. Run below query to find the captured events. If you are T-SQL lover and wanted to do above process by query so here you can find the same. Audit is very important as it tracks all activities performed by team members in project like which user has dropped table, who executed procedure, what permissions changed or created etc. all getting captured in SQL Server audit. Thanks recently i used this to findout, every one month on 1 week database owner is changing automatically from sa to other user, we used audit database owner change and findout it.